NASHVILLE, Tenn.— Small churches can make a difference by sticking to the basics. New research with the Billy Graham Center and the Caskey Center for Church Excellence identifies at least 13 effective ways small churches can attract and retain more new converts, including many practices churches have used for years. The research, additionally sponsored by 11 denominations, and undertaken by LifeWay Research, shows that among the 13 are: holding classes for new attenders, committing a healthy portion of the church budget to evangelism and missions, serving outside the church to share the gospel with unchurched people, and having the pastor set up specific hours to share the gospel. LifeWay Research tested 29 factors that could potentially affect the number of people who decide to follow Christ and stay committed to small churches. Thirteen of those factors predicted which churches retained more converts. 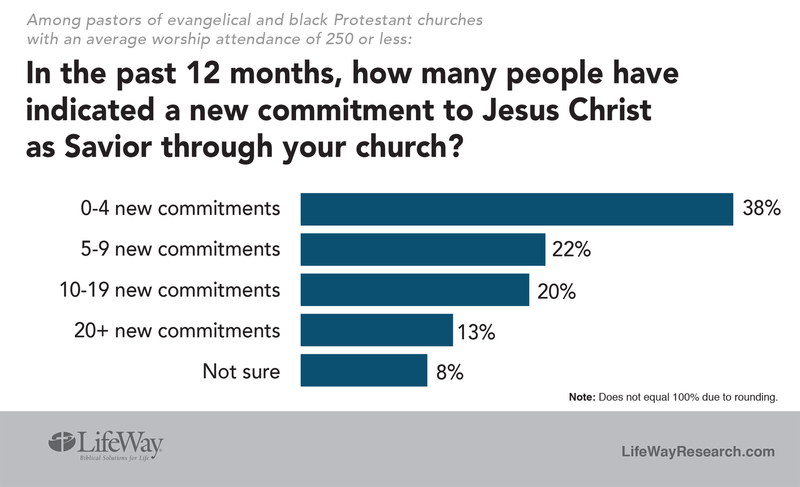 The phone survey of 1,500 pastors of small churches—evangelical and Black Protestant congregations of 250 or fewer—asked how many converts each church had in the last 12 months and whether those converts stayed with the church after they came to faith. Researchers then compared the 20 percent of churches with the most retained converts (11.7 or more per 100 attendees) to the 50 percent with the fewest retained converts (5.56 or fewer per 100 attendees). 93 percent say their church engages in ministry outside the church at least every six months to share the gospel with the unchurched. 92 percent consistently hear reports of church members engaging in evangelistic conversations and sharing their faith with non-Christians. 68 percent offer classes for new attenders at least every six months. 66 percent ask people weekly to commit to Christ following a personal presentation of the gospel. 57 percent block out time on their calendar at least once a week for the purpose of sharing their faith with non-Christians outside the church office. 51 percent attend training on personal evangelism at least every six months. 26 percent have a higher percentage of the church’s budget (30 percent or more) given to evangelism and missions. 83 percent say their church engages in ministry outside the church at least every six months to share the gospel with the unchurched. 77 percent consistently hear reports of church members engaging in evangelistic conversations and sharing their faith with non-Christians. 47 percent offer classes for new attenders at least every six months. 37 percent ask people weekly to commit to Christ following a personal presentation of the gospel. 31 percent block out time on their calendar at least once a week for the purpose of sharing their faith with non-Christians outside the church office. 32 percent attend training on personal evangelism at least every six months. 16 percent have a higher percentage of the church’s budget (30 percent or more) given to evangelism and missions. The number one predictive factor, according to researchers: Churches with more converts tended to attract and keep more unchurched people. Pastors of churches with the most retained converts were more likely (35 percent) to say half of their congregation used to be unchurched. That dropped to 18 percent for churches with the fewest retained converts. Small churches may be able to reach more people simply by doing what they are already doing—with a little more consistency, said McConnell. Asking more non-Christians to come to church, sharing the gospel with them, following up with them, and inviting them to follow Jesus can all lead to more converts. Jeff Farmer, associate professor of church, ministry, and evangelism at New Orleans Seminary and lead researcher on the project, said that inviting more unchurched people to attend services is key. “We need to be focusing on lost people—those who have no previous church background—and there are plenty of them,” he said. Rick Richardson of the Billy Graham Center at Wheaton College agrees, saying that the churches with the most converts in the study seemed to do a better job at attracting and keeping new people. “Those churches go the extra mile when it comes to inviting people and extending hospitality,” he said. Overall, Richardson was encouraged by the study, which showed that most small churches are active in evangelism. They’re doing the right things, said Richardson. They just need to become more consistent in evangelism and outreach. “A few small things can make a big difference,” he said. The study was sponsored by the Billy Graham Center at Wheaton College and the Caskey Center for Church Excellence at New Orleans Baptist Theological Seminary. The phone survey of pastors of churches in evangelical and black Protestant denominations was conducted March 16 to March 31, 2017. The calling list was a random sample, stratified by church membership and denominational groups, drawn from a list of all evangelical and black Protestant churches. Each interview was conducted with the senior pastor, minister or priest of the church called. The completed sample is 1,500 surveys. Responses were weighted by region and denominational group to more accurately reflect the population. The sample provides 95 percent confidence that the sampling error does not exceed plus or minus 2.7 percent (This margin of error accounts for the effect of weighting). Margins of error are higher in sub-groups. The research was sponsored by the Billy Graham Center, the Caskey Center, the Assemblies of God, the Associate Reformed Presbyterian Church, the Church of the Nazarene, the Conservative Congregational Christian Conference, Converge Worldwide, the Evangelical Covenant Church, the Evangelical Free Church of America, the Foursquare Church, The Missionary Church, the Southern Baptist Convention, Vineyard USA, and The Wesleyan Church.